The northern and western corn rootworms are well-known insect pests of continuous corn grown in Iowa. Rootworms are beetle larvae that spend the spring and early summer in the soil eating roots of corn plants. Heavy populations of rootworm larvae are capable of severely stunting the growth of corn. In mid-summer the rootworm larvae transform to adult beetles that are approximately one-quarter inch long and slender. Northern corn rootworm beetles are uniformly pale green and western corn rootworm beetles are yellow with black stripes. The beetles remain in the corn fields and lay eggs in the soil until mid to late August at which time they begin to wander. Corn rootworm beetles wandering away from corn fields are frequently a late-summer pest in gardens where they feed on flowers and vegetables. They may become numerous on a wide variety of plants but seem most attracted to light colored flowers such as dahlias, roses, and others. Even small numbers of beetles can ruin flowers by feeding on the moist buds or petals. Rootworm beetles are also common in melon and pumpkin patches where they feed on fruit rinds. 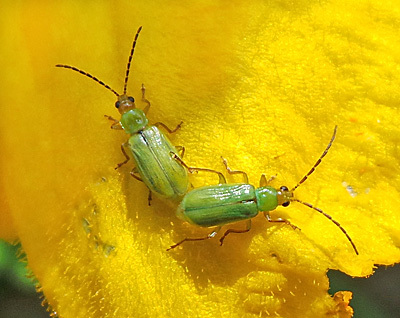 There are no completely effective control methods for rootworm beetles on flowers in late summer. Insecticides sprays are of limited effectiveness and repeated applications are required for even modest impact. Unfortunately, insecticides applied to blooms may kill bees and other beneficial, pollinating insects. Screening highly-prized blossoms with cheese-cloth, nylon netting or other light fabric is one way to avoid attack but may not always be practical. Ultimately the number of beetles dwindles by late summer and they disappear completely with frost. Learning to tolerate a little damage is probably the most practical response. What is the correct way to plant sweet corn in the home garden?